How should milk be stored? How long does it last? What’s a serving of dairy? Below are some helpful tips to make the most of your Arps Dairy products. Buy milk and other dairy products toward the end of your shopping trip to keep them colder longer. Store milk and other dairy products in the back of the refrigerator where it stays coldest, and always below 40°F. Never store milk in the refrigerator door where it is susceptible to warmer air from opening and closing the door. Remember to open new milk containers in the same order in which you bought them. First in the refrigerator, first out. To maintain freshness, keep the milk stored in its original container. Sometimes milk can absorb other flavors while stored in the fridge, which is okay; it is still safe! Keep the container securely closed to help avoid this. Milk that has been poured out of its container should never be poured back into the original container. Add richness, tenderness and moisture to bread dough and other baked goods by replacing the water with fresh milk. Make a richer and more nutritious hot chocolate from a powdered mix by replacing the water with milk. Make fluffier scrambled eggs and omelets with milk by whisking about 2 tablespoons of milk into each beaten egg. 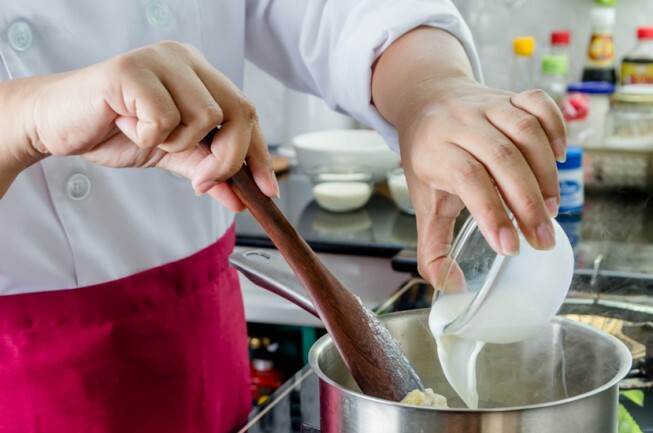 Use milk instead of water when preparing canned or packaged soups for a creamier, richer soup. Chill your glass in the refrigerator or freezer for about 15 minutes before pouring in milk for an extra-frosty drink.